In just four days, M23 has been dislodged from every one of the strongholds it once held. This surprisingly rapid reversal of fortunes for the group was unprecedented only weeks ago when most experts predicted that it would take significant effort to remove M23 from towns like Kibumba, Rumangabo and Rutshuru. Despite M23’s claims that its withdrawals were intentional, the group relinquished heavily-fortified positions all over North Kivu that it had only recently reinforced after the fighting in August. While M23 is not yet fully defeated, there is little doubt that it has suffered a crushing military loss. 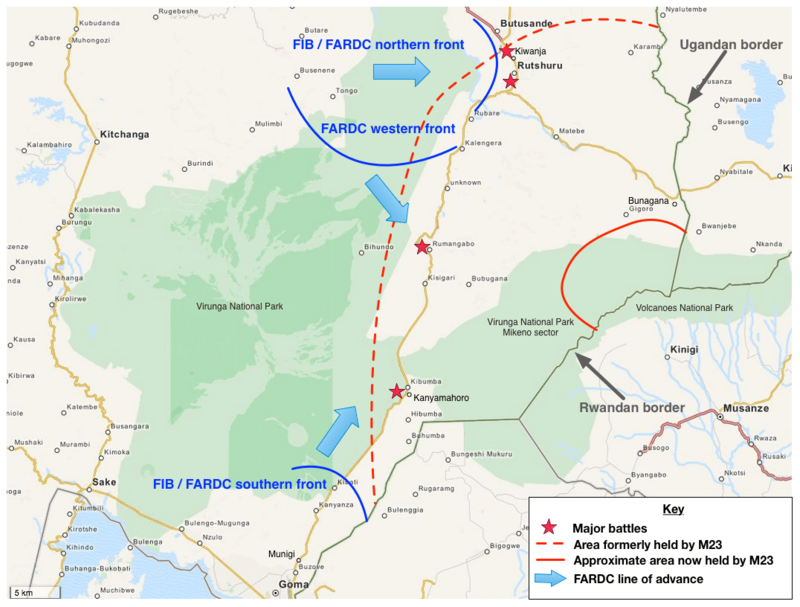 This analysis will explain why FARDC, the DRC’s national army, backed up by the United Nations Force Intervention Brigade (FIB) was able dislodge M23 so rapidly. Map of the situation in North Kivu during the fighting against M23 in October 2013. Click to expand. It’s an axiom of military strategy that whichever force has both the advantage in positioning and logistics has a much greater chance of winning any battles. This is especially true when doing so can cause the opposing army to split its forces. When fighting between FARDC, the FIB and M23 resumed at 04h00 on Friday morning, FARDC and the FIB were well prepared and well-placed for an engagement. Over the past few weeks, both FARDC and the United Nations moved troops to new positions around North Kivu that were designed to encircle and split M23’s forces in and around the major towns on the important Kibumba-Rumangabo-Rutshuru axis. According to a sources in the area, this was done after intelligence reports indicated that M23 may try to launch an attack should the Kampala talks reach a deadlock. Using UN Mi-8s, Oryxes and Mi-26s, FIB troops were separated into three task forces and deployed near Kiwanja, Munigi/Kibati and north-west of Rutshuru. These FIB task forces were intended as a blocking force to back up FARDC, which as was the case during the last round of fighting in August would take the lead in any operations. At the same time, FARDC also established three of its own task groups, including 41, 805, 806 and 809 infantry battalions amongst others, backed up by heavy artillery, rockets and air support along three fronts near Kibati, Kiwanja and inside Virunga National Park between Busenene and Kalengera respectively. Crucially, this involved establishing sufficient logistics for each front, avoiding the typical problem in Congolese operations where poor roads make operations riskier the further they move away from main logistics bases. It was also the first time the entire FIB was together in a single operation, as the Malawian infantry who arrived earlier in October were part of the UN positions. The combination of these forces created a three-front war against M23 for the first time, establishing a southern, western and northern front and forcing M23 to split its forces. It formed a pincer movement that squeezed M23 out from its strongholds and into the Virunga mountains against the Rwandan border. It also proved that the FIB concept works, as the support its troops provided were what allowed for the three fronts to be established. The FARDC forces deployed against M23 since August are a far cry from the disorganised, demoralised and poorly-trained soldiers that were so easily swept aside when Goma was captured in November last year. Most credit for the improvement must go to the new commander of North Kivu’s 8th Military Region, Maj. Gen. Bahuma Ambamba, and his subordinate unit commanders. Following the embarrassing loss of Goma last year, DRC President Joseph Kabila recalled most of the 8th Military Region’s commanders back to Kinshasa and replaced them with a trusted team led by Maj. Gen. Ambamba. Understanding the Force Intervention Brigade in an infographic. In less than 12 months, Maj. Gen. Ambamba has transformed the forces under his control, cracking down on ill-discipline, improving training especially for combined operations, raising morale and earning a good reputation both amongst his soldiers and the MONUSCO forces in North Kivu. The result has been a FARDC that is capable of effective combined-arms operations involving artillery, multiple-launch rocket systems and attack helicopters while advancing at a previously-unseen pace through M23-held territory. The troops have high-morale and there have been no recent reports of atrocities commited, something which used to be a hallmark of many FARDC operations. This has interesting implications for the potential of FARDC to eventually be able to maintain a monopoly of force in the eastern DRC. The new commanders of both MONUSCO and the FIB have also played critical roles in rolling back M23, as they have pursued a more pro-active stance and exploited UNSC Resolution 2098 to the fullest to enable direct combat operations against M23. FIB commander Brig Gen. James Mwakibolwa in particular has shown excellent tactical understanding by utilising the UN’s air assets and the FIB’s artillery and mortar units to act as force multipliers that supported FARDC’s offensive against M23 to great effect without the need to commit large numbers of infantry from the FIB’s three national contingents. Yet that would have meant nothing without the strong backing of Lt. Gen. Carlos dos Santos Cruz, the MONUSCO Force Commander, and Martin Kobler, the Special Representative for MONUSCO. Both men came to MONUSCO with a reputation for decisiveness and have provided the space for the FIB to conduct offensive operations. Despite this, there have still been occasions where the FIB has been frustrated in its requests for stronger action, but it has had much greater freedom to act than any other UN force in recent history. The FARDC assault began on the M23 positions atop strategic hill of Kanyamahoro, less than a kilometre from the forward line of FARDC troops near Kibumba. Over the past month, M23 had significantly reinforced their position on Kanyamahoro, building deep earthen bunkers, stationing machine guns and concentrating a large number of soldiers. As it overlooked the Route Nationale 2 that goes from Goma to Kibumba, this hill had to be conquered first by any force coming up from the south if they wanted to reach Kibumba. Yet despite the fortifications, Kanyamahoro fell swiftly to the rocket fire, Mi-24 attack helicopters and troops of the FARDC, surprising the M23 defenders and opening the route to Kibumba. At the same time, the FARDC forces on the northern and western fronts sprang into action, heading towards Rumangabo, Kiwanja and Rutshuru. In each case the fighting was brutal and bloody but over quickly, as the M23 forces retreated under heavy fire. there have still been occasions where the FIB has been frustrated in its requests for stronger action, but it has had much greater freedom to act than any other UN force in recent history. Within four days, every major town and position held by M23 had fallen and the group had retreated to a small area in the Virunga mountains near the border with Rwanda where they remain. The FIB and greater MONUSCO role in this action should not be overlooked, as the FIB blocking forces deployed along both the northern and southern fronts were crucial in freeing up FARDC forces to go on the offensive. FIB infantry forces were engaged with M23 both in the south and in the north, especially in Kiwanja and in the hilly region north-east of Rutshuru. It was in these engagements that Lt. Mlima, a Tanzanian peacekeeper with the FIB, was shot dead during a battle with M23 forces in the hills. But direct FIB involvement was less this time around than back in August, perhaps because the counter-attack against M23 came as a surprise. No UN artillery, mortars or Mi-24P attack helicopters were used, though they were placed on standby if needed. First and foremost, it’s important to understand that M23 is not yet defeated, even though its military capacity has been badly eroded. If given too much breathing room it’s possible that M23 could become a threat once more, so it’s important for the advantage to be pressed home. However that does not mean that a military solution is called for, as further action against M23 risks drawing Rwanda into the conflict. Rather, there must be a return to the Kampala talks where an agreement must be reached between the DRC and Rwanda for the latter to abandon M23 and force its members to disarm. This will only be achieved if Rwanda receives the firm commitment, backed by the FIB, that the FDLR will be the next group to be neutralised. This will be politically difficult for the DRC, which has often unofficially formed alliances with the FDLR against other groups like M23, but it’s essential to ease Rwanda’s fears and prevent that country from trying to resurrect M23. The FIB has performed well, so its mandate should be extended at least another 12 months. The fighting of the past two months has highlighted a number of issues though, foremost amongst them the often severe communications problems between FIB contingents and the FIB and the rest of MONUSCO, mostly due to incompatible and ineffective radio equipment. This needs to be rectified as a matter of urgency. Other weaknesses are in aerial surveillance and air support, both of which should be alleviated somewhat by the arrival of Falco drones in December and the deployment of Rooivalk attack helicopters from South Africa, with the first helicopter already in Goma and the remaining three two soon to follow. They will be backed up by five South African Air Force Oryx transport helicopters. By inflicting a massive military defeat on M23, both the FARDC and FIB have proven doubters wrong and validated the concept of a more pro-active UN peacekeeping force acting in concert with the national army. The challenge now will be to protect the newly-won peace, establishing long-lasting security in the areas formerly held by M23 and preventing abuses by Congolese state security forces. If the DRC government and MONUSCO can succeed at that, they stand a chance at bringing about long-lasting peace and stability in the region.